Our national competition is open to all UK students who take part in Apps for Good courses. Empower and encourage your students to submit their projects through the student awards page. See below for an overview of the judging criteria and how to help students prepare their awards entry. See the key dates on the awards overview page. We are looking for solutions that demonstrate innovative thinking and stand out from the rest. Finalists and winners are selected by our judges from the industry. How well does the solution address the problem? Judges are looking for an innovative and thoroughly developed solution addressing a clearly defined and researched problem. How well do the features and prototype bring the idea to life? Judges are looking for thoughtful and user-centered features and an excellent working prototype. How well presented and clear is the overall project? Judges are looking for projects that are professionally presented and clear throughout. For your students to succeed in the Awards they will need to both meet our judging criteria and present an entry that stands out from the many we receive each year. Students need to submit their entry on the student awards page. You'll be sent an email when a team enters, confirming their submission. 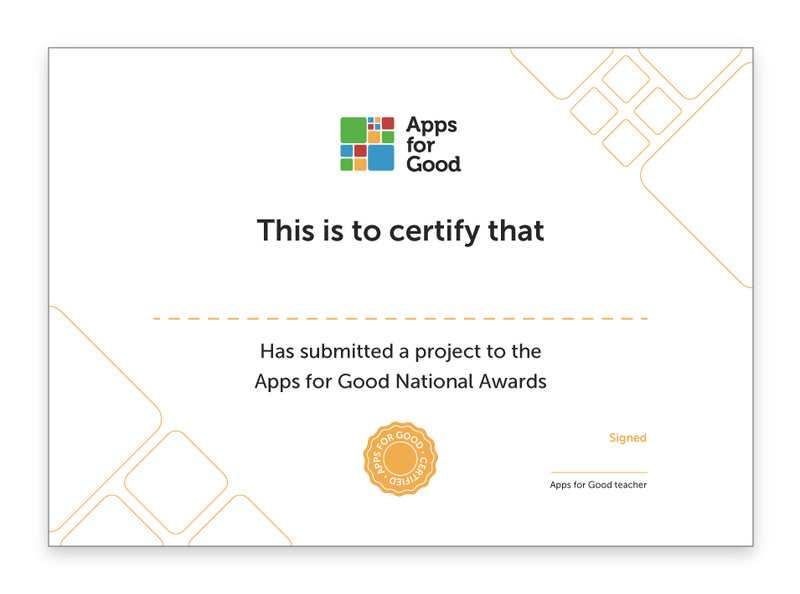 To reward your students for entering and for their great work, you can print out and fill in an Apps for Good certificate (below). You'll be emailed the links when your students submit their projects.